For the scientific-technical journal, see Oil Shale (journal). Not to be confused with Shale oil or Tight oil. Oil shale is an organic-rich fine-grained sedimentary rock containing kerogen (a solid mixture of organic chemical compounds) from which liquid hydrocarbons can be produced, called shale oil (not to be confused with tight oil—crude oil occurring naturally in shales). Shale oil is a substitute for conventional crude oil; however, extracting shale oil from oil shale is more costly than the production of conventional crude oil both financially and in terms of its environmental impact. 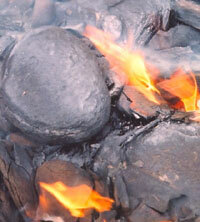 Deposits of oil shale occur around the world, including major deposits in the United States. A 2016 estimate of global deposits set the total world resources of oil shale equivalent of 6.05 trillion barrels (962 billion cubic metres) of oil in place. As of 2008[update], industry uses oil shale in Brazil, China, Estonia and to some extent in Germany, and Russia. Several additional countries started assessing their reserves or had built experimental production plants, while others had phased out their oil shale industry. Oil shale serves for oil production in Estonia, Brazil, and China; for power generation in Estonia, China, and Germany; for cement production in Estonia, Germany, and China; and for use in chemical industries in China, Estonia, and Russia. As of 2009[update], 80% of oil shale used globally is extracted in Estonia, mainly due to the Oil-shale-fired power plants. Oil-shale-fired power plants occur in Estonia, which has an installed capacity of 2,967 megawatts (MW), China (12 MW), and Germany (9.9 MW). Israel, Romania and Russia have in the past run power plants fired by oil shale, but have shut them down or switched to other fuel sources such as natural gas. Jordan and Egypt plan to construct power plants fired by oil shale, while Canada and Turkey plan to burn oil shale along with coal for power generation. Oil shale serves as the main fuel for power generation only in Estonia, where 90.3% of country's electrical generation in 2016 was produced from oil shale. Industry can use oil shale as a fuel for thermal power-plants, burning it (like coal) to drive steam turbines; some of these plants employ the resulting heat for district heating of homes and businesses. 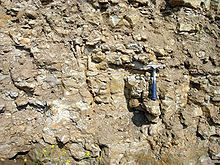 In addition to its use as a fuel, oil shale may also serve in the production of specialty carbon fibers, adsorbent carbons, carbon black, phenols, resins, glues, tanning agents, mastic, road bitumen, cement, bricks, construction and decorative blocks, soil-additives, fertilizers, rock-wool insulation, glass, and pharmaceutical products. However, oil shale use for production of these items remains small or only in its experimental stages. Some oil shales yield sulfur, ammonia, alumina, soda ash, uranium, and nahcolite as shale-oil extraction byproducts. Between 1946 and 1952, a marine type of Dictyonema shale served for uranium production in Sillamäe, Estonia, and between 1950 and 1989 Sweden used alum shale for the same purposes. Oil shale gas has served as a substitute for natural gas, but as of 2009[update], producing oil shale gas as a natural-gas substitute remained economically infeasible. Oil Shale is considered to be extremely cheap and versatile.The amount of economically recoverable oil shale is unknown. The various attempts to develop oil shale deposits have succeeded only when the cost of shale-oil production in a given region comes in below the price of crude oil or its other substitutes. According to a survey conducted by the RAND Corporation, the cost of producing a barrel of oil at a surface retorting complex in the United States (comprising a mine, retorting plant, upgrading plant, supporting utilities, and spent shale reclamation), would range between US$70–95 ($440–600/m3, adjusted to 2005 values). This estimate considers varying levels of kerogen quality and extraction efficiency. In order to run a profitable operation, the price of crude oil would need to remain above these levels. The analysis also discusses the expectation that processing costs would drop after the establishment of the complex. The hypothetical unit would see a cost reduction of 35–70% after producing its first 500 million barrels (79 million cubic metres). Assuming an increase in output of 25 thousand barrels per day (4.0×10^3 m3/d) during each year after the start of commercial production, RAND predicts the costs would decline to $35–48 per barrel ($220–300/m3) within 12 years. After achieving the milestone of 1 billion barrels (160 million cubic metres), its costs would decline further to $30–40 per barrel ($190–250/m3). Some commentators compare the proposed American oil-shale industry to the Athabasca oil-sands industry (the latter enterprise generated over 1 million barrels (160,000 cubic metres) of oil per day in late 2007), stating that "the first-generation facility is the hardest, both technically and economically". A 1972 publication in the journal Pétrole Informations (ISSN 0755-561X) compared shale-based oil production unfavorably with coal liquefaction. The article portrayed coal liquefaction as less expensive, generating more oil, and creating fewer environmental impacts than extraction from oil shale. It cited a conversion ratio of 650 liters (170 U.S. gal; 140 imp gal) of oil per one ton of coal, as against 150 liters (40 U.S. gal; 33 imp gal) of shale oil per one ton of oil shale. ^ a b c Youngquist, Walter (1998). "Shale Oil - The Elusive Energy" (PDF). Hubbert Center Newsletter. Colorado School of Mines (4). Retrieved 17 April 2008. ^ a b c d e f g h Dyni, John R. (2006). "Geology and resources of some world oil shale deposits. Scientific Investigations Report 2005–5294" (PDF). United States Department of the Interior, United States Geological Survey. Retrieved 9 July 2007. ^ Energy Security of Estonia (PDF) (Report). Estonian Foreign Policy Institute. September 2006. Archived from the original (PDF) on 8 January 2012. Retrieved 20 October 2007. ^ "Oil Shale and Other Unconventional Fuels Activities". United States Department of Energy. Retrieved 9 February 2014. ^ a b c d Burnham, A. K. (20 August 2003). "Slow Radio-Frequency Processing of Large Oil Shale Volumes to Produce Petroleum-like Shale Oil" (PDF). Lawrence Livermore National Laboratory. UCRL-ID-155045. Retrieved 28 June 2007. ^ a b "Environmental Impacts from Mining" (PDF). The Abandoned Mine Site Characterization and Cleanup Handbook. United States Environmental Protection Agency. August 2000. pp. 3/1–3/11. Retrieved 21 June 2010. ^ a b c Ots, Arvo (12 February 2007). "Estonian oil shale properties and utilization in power plants" (PDF). Energetika. Lithuanian Academy of Sciences Publishers. 53 (2): 8–18. Retrieved 6 May 2011. ^ a b c Altun, N. E.; Hiçyilmaz, C.; Hwang, J.-Y. ; Suat Bağci, A.; Kök, M. V. (2006). "Oil shales in the world and Turkey; reserves, current situation and future prospects: a review" (PDF). Oil Shale. A Scientific-Technical Journal. Estonian Academy Publishers. 23 (3): 211–227. ISSN 0208-189X. Retrieved 16 June 2007. ^ Hutton, Adrian C. (1994). "Organic petrography and oil shales" (PDF). Energeia. University of Kentucky. 5 (5). Archived from the original (PDF) on 4 October 2013. Retrieved 19 December 2012. ^ a b c Urov, K.; Sumberg, A. (1999). "Characteristics of oil shales and shale-like rocks of known deposits and outcrops" (PDF). Oil Shale. A Scientific-Technical Journal. Estonian Academy Publishers. 16 (3 Special): 1–64. ISBN 978-9985-50-274-7. ISSN 0208-189X. Retrieved 22 September 2012. ^ Nield, Ted (17 February 2007). "Shale of the century?". Geoscientist. Geological Society of London. 17 (2). Retrieved 4 February 2018. ^ O'Neil, William D. (11 June 2001). "Oil as a strategic factor. The supply of oil in the first half of the 21st century, and its strategic implications for the U.S." (PDF). CNA Corporation: 94–95. Retrieved 19 April 2008. ^ a b Cane, R.F. (1976). "The origin and formation of oil shale". In Teh Fu Yen; Chilingar, George V. (eds.). Oil Shale. Amsterdam: Elsevier. pp. 1–12, 56. ISBN 978-0-444-41408-3. Retrieved 5 June 2009. ^ van Krevelen (1993), p. ? ^ Alali, Jamal (7 November 2006). Jordan oil shale, availability, distribution, and investment opportunity (PDF). International Oil Shale Conference. Amman, Jordan. Archived from the original (PDF) on 27 May 2008. Retrieved 4 March 2008. ^ a b Hutton, A.C. (1987). "Petrographic classification of oil shales". International Journal of Coal Geology. Amsterdam: Elsevier. 8 (3): 203–231. doi:10.1016/0166-5162(87)90032-2. ISSN 0166-5162. ^ a b c d e Brendow, K. (2003). "Global oil shale issues and perspectives. Synthesis of the Symposium on Oil Shale. 18–19 November, Tallinn" (PDF). Oil Shale. A Scientific-Technical Journal. Estonian Academy Publishers. 20 (1): 81–92. ISSN 0208-189X. Retrieved 21 July 2007. ^ Qian, Jialin; Wang, Jianqiu; Li, Shuyuan (2003). "Oil Shale Development in China" (PDF). Oil Shale. A Scientific-Technical Journal. Estonian Academy Publishers. 20 (3): 356–359. ISSN 0208-189X. Retrieved 16 June 2007. ^ "About Oil Shale". Argonne National Laboratory. Archived from the original on 13 October 2007. Retrieved 20 October 2007. ^ Allix, Pierre; Burnham, Alan K. (1 December 2010). "Coaxing Oil from Shale" (PDF). Oilfield Review. Schlumberger. 22 (4): 6. Retrieved 18 April 2012. ^ "Bibliographic Citation: Non-synfuel uses of oil shale". United States Department of Energy. OSTI 6567632. ^ West, Ian (6 January 2008). "Kimmeridge - The Blackstone - Oil Shale". University of Southampton. Retrieved 9 February 2014. ^ Moody, Richard (20 April 2007). UK Oil and Gas Shales—Definitions and Distribution in Time and Space. History of On-Shore Hydrocarbon Use in the UK. Weymouth: Geological Society of London. Retrieved 6 September 2014. ^ a b c Laherrère, Jean (2005). "Review on oil shale data" (PDF). Hubbert Peak. Retrieved 17 June 2007. ^ Doscher, Todd M. "Petroleum". MSN Encarta. Archived from the original on 21 April 2008. Retrieved 22 April 2008. ^ "Oil Shale Committee-EMD". American Association of Petroleum Geologists. Retrieved 4 February 2018. ^ a b Yin, Liang (7 November 2006). Current status of oil shale industry in Fushun, China (PDF). International Oil Shale Conference. Amman, Jordan. Archived from the original (PDF) on 28 September 2007. Retrieved 29 June 2007. ^ Collier, Robert (4 September 2006). "Coaxing oil from huge U.S. shale deposits". San Francisco Chronicle. Retrieved 19 December 2012. ^ a b c d Andrews, Anthony (13 April 2006). "Oil Shale: History, Incentives, and Policy" (PDF). Congressional Research Service. Retrieved 25 June 2007. ^ "Nominations for Oil Shale Research Leases Demonstrate Significant Interest in Advancing Energy Technology" (Press release). Bureau of Land Management. 20 September 2005. Archived from the original on 16 September 2008. Retrieved 10 July 2007. ^ "What's in the Oil Shale and Tar Sands Leasing Programmatic EIS". Oil Shale and Tar Sands Leasing Programmatic EIS Information Center. Archived from the original on 3 July 2007. Retrieved 10 July 2007. ^ a b c d Francu, Juraj; Harvie, Barbra; Laenen, Ben; Siirde, Andres; Veiderma, Mihkel (May 2007). "A study on the EU oil shale industry viewed in the light of the Estonian experience. A report by EASAC to the Committee on Industry, Research and Energy of the European Parliament" (PDF). European Academies Science Advisory Council: 12–13, 18–19, 23–24, 28. Archived from the original (PDF) on 26 July 2011. Retrieved 21 June 2010. ^ Alali, Jamal; Abu Salah, Abdelfattah; Yasin, Suha M.; Al Omari, Wasfi (2006). "Oil Shale in Jordan" (PDF). Natural Resources Authority of Jordan. Retrieved 11 June 2017. ^ "Importance of Future Oil Shale Industry Plans for Estonia". Estonian Ministry of Economic Affairs and Communications. 8 June 2009. Archived from the original on 16 July 2011. Retrieved 2 September 2009. ^ Qian, Jialin; Wang, Jianqiu; Li, Shuyuan (15 October 2007). One Year's Progress in the Chinese Oil Shale Business (PDF). 27th Oil Shale Symposium. Golden, Colorado: China University of Petroleum. Retrieved 6 May 2011. ^ Azulai, Yuval (22 March 2011). "We are not drying up the Dead Sea". Globes. Retrieved 9 February 2014. ^ Hamarneh, Yousef; Alali, Jamal; Sawaged, Suzan (1998). "Oil Shale Resources Development In Jordan". Amman: Natural Resources Authority of Jordan. ^ Beger, Mariliis, ed. (2017). Estonian Oil Shale Industry. Yearbook 2016 (PDF). Eesti Energia, VKG, KKT, Tallinn University of Technology. p. 18. Retrieved 29 January 2018. ^ a b c Bartis, James T.; LaTourrette, Tom; Dixon, Lloyd; Peterson, D.J. ; Cecchine, Gary (2005). Oil Shale Development in the United States. Prospects and Policy Issues. Prepared for the National Energy Technology Laboratory of the U.S. Department of Energy (PDF). RAND Corporation. ISBN 978-0-8330-3848-7. Retrieved 29 June 2007. ^ Burnham, Alan K.; McConaghy, James R. (16 October 2006). Comparison of the Acceptability of Various Oil Shale Processes (PDF). 26th Oil Shale Symposium. Golden, Colorado: Lawrence Livermore National Laboratory. UCRL-CONF-226717. Retrieved 23 June 2007. ^ Koel, Mihkel (1999). "Estonian oil shale". Oil Shale. A Scientific-Technical Journal. Estonian Academy Publishers (Extra). ISSN 0208-189X. Retrieved 21 July 2007. ^ a b Johnson, Harry R.; Crawford, Peter M.; Bunger, James W. (March 2004). "Strategic Significance of America's Oil Shale Resource. Volume II Oil Shale Resources, Technology and Economics" (PDF). United States Department of Energy. Retrieved 24 September 2017. ^ "Process for the recovery of hydrocarbons from oil shale". FreePatentsOnline. Retrieved 3 November 2007. ^ Qian, Jialin; Wang, Jianqiu (7 November 2006). "World oil shale retorting technologies" (PDF). Amman, Jordan. Archived from the original (PDF) on 27 May 2008. Retrieved 29 June 2007. ^ Valgma, Ingo. "Map of oil shale mining history in Estonia". Mining Institute of Tallinn Technical University. Retrieved 21 July 2007. ^ Dyni, John R. (1 April 1983). "Distribution and origin of sulfur in Colorado oil shale". 16th Oil Shale Symposium Proceedings. U.S. Geological Survey: 144–159. OSTI 5232531. CONF-830434-. ^ "Statement Of Daniel Yergin, Chairman of Cambridge Energy Research Associates, Before The Committee On Energy And Commerce/U.S. House Of Representatives". United States House of Representatives. 4 May 2006. Retrieved 19 December 2012. ^ Kolbert, Elizabeth (12 November 2007). "A Reporter at Large:Unconventional Crude". The New Yorker. Retrieved 31 March 2008. ^ Seebach, Linda (2 September 2005). "Shell's ingenious approach to oil shale is pretty slick". Rocky Mountain News. Archived from the original on 20 April 2008. Retrieved 2 June 2007. ^ Schmidt, S. J. (2003). "New directions for shale oil:path to a secure new oil supply well into this century: on the example of Australia" (PDF). Oil Shale. A Scientific-Technical Journal. Estonian Academy Publishers. 20 (3): 333–346. ISSN 0208-189X. Retrieved 2 June 2007. ^ Veski, R.; Palu, V.; Kruusement, K. (2006). "Co-liquefaction of kukersite oil shale and pine wood in supercritical water" (PDF). Oil Shale. A Scientific-Technical Journal. Estonian Academy Publishers. 23 (3): 236–248. ISSN 0208-189X. Retrieved 16 June 2007. ^ Aboulkas, A.; El Harfi, K.; El Bouadili, A.; Benchanaa, M.; Mokhlisse, A.; Outzourit, A. (2007). "Kinetics of co-pyrolysis of Tarfaya (Morocco) oil shale with high-density polyethylene" (PDF). Oil Shale. A Scientific-Technical Journal. Estonian Academy Publishers. 24 (1): 15–33. ISSN 0208-189X. Retrieved 16 June 2007. ^ Ozdemir, M.; Akar, A.; Aydoğan, A.; Kalafatoglu, E.; Ekinci, E. (7 November 2006). "Copyrolysis of Goynuk oil shale and thermoplastics" (PDF). Amman, Jordan. Archived from the original (PDF) on 27 May 2008. Retrieved 29 June 2007. ^ Cleveland, Cutler J.; Costanza, Robert; Hall, Charles A. S.; Kaufmann, Robert (31 August 1984). "Energy and the U.S. Economy: A Biophysical Perspective". Science. American Association for the Advancement of Science. 225 (4665): 890–897. Bibcode:1984Sci...225..890C. doi:10.1126/science.225.4665.890. ISSN 0036-8075. PMID 17779848. ^ a b "Chapter 4. Effects of Oil Shale Technologies" (PDF). Proposed Oil Shale and Tar Sands Resource Management Plan Amendments to Address Land Use Allocations in Colorado, Utah, and Wyoming and Final Programmatic Environmental Impact Statement. Bureau of Land Management. September 2008. pp. 4‑3. FES 08-32. Archived from the original (PDF) on 27 May 2010. Retrieved 7 August 2010. ^ Huebner, Walter F., ed. (1990). Physics and Chemistry of Comets. Springer-Verlag. ISBN 978-3-642-74805-9. Cane, R.F. (1976). "The origin and formation of oil shale". In Teh Fu Yen; Chilingar, George V. (eds.). Oil Shale. Amsterdam: Elsevier. pp. 1–12, 56. ISBN 978-0-444-41408-3. Dyni, John R. (2010). "Oil Shale" (PDF). In Clarke, Alan W.; Trinnaman, Judy A. (eds.). Survey of energy resources (22 ed.). World Energy Council. ISBN 978-0-946121-02-1. Archived (PDF) from the original on 4 March 2012.
van Krevelen, Dirk Willem (1993). Coal--typology, physics, chemistry, constitution. Coal Science and Technology Series (3 ed.). Elsevier. ISBN 978-0-444-89586-8. "Related Oil Shale Publications and Data". U.S. Geological Survey. Archived from the original on 22 October 2011. Retrieved 22 April 2008. This page was last edited on 14 March 2019, at 02:35 (UTC).